American governments no longer simply praises good and punishes evil (Romans 13:3-5). American governments, at all scales from Federal to municipal are now full of active evil. These governments demand nothing less than worship, and that I cannot abide. I will not worship the almighty State, regardless of the gentle encouragements of the nightly news, or the twisting of the Scriptures by deluded Christians, who deceive themselves that our government cannot be any worse than the one to which the Apostle Paul enjoined obedience. I will not depend on government for my security, my sustenance or my feeling of well-being. Given the results in other places around the world of other peoples doing so, I will not surrender my arms, to which I have a God-given right, to any government infringement, whether it has been voted in by the majority, or not. If I can, I will flee jurisdictions who seek to exact from me more taxes, and not engage in commerce that brings such about. I will not pay any more taxes, fees, honors, or duties to the State than I am bound by law to pay. 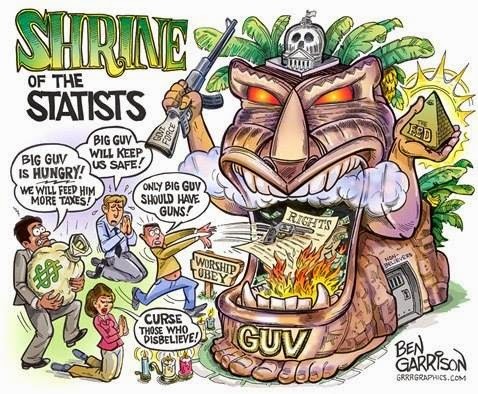 I will not bow at the Shrine of the State.